All along with this project there were a few things I knew would be the big issues to get over. 1. Engine and transmission install – it fits and it’s mounted 2. Adapting the new transmission to the BMW dif, this is next…. 3. Building a new pedal assembly – done over break 4. 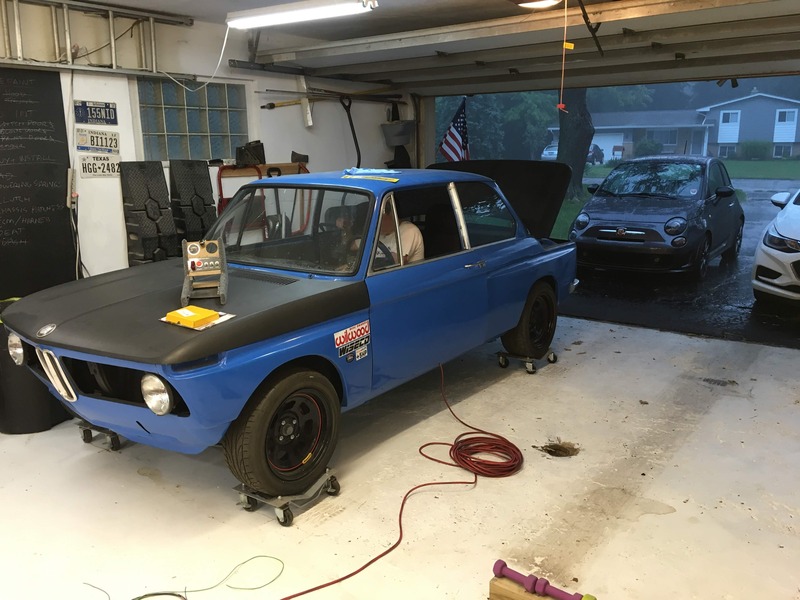 Fixing the rust and bodywork – done over break 5. Rewiring the whole call – TBD 6. Making the rack and pinion steering work – finally finished over break As you can see the list is getting shorter. The bodywork turned out much worse than I had hoped. I did not spend as much time blocking the car as I should have. At some point I may go back and redo the bodywork and paint to have a nicer looking car. At this point it’s ok from a distance, and for its intended purpose its fine. This car was rotten and not worth saving. As bad as my bodywork is, it’s still miles better than what I found. All that to say, here it is, on all four wheels in the sun! Next up was the pedal assembly. I worked with Wilwood to size the master cylinders to work with the 240 front calipers and the 320i rear drums. I will also be running a Wilwood master cylinder for the clutch. The other interesting part I had to add was the electronic throttle pedal to work with the LE5. The pedal is typically firewall mounted and top hinged. I flipped it and mounted it to a subframe with the other two pedals. I have them all hinged at the same point and in the same plane. I may need to tweak the throttle to prevent miss-steps. The steering was the next big challenge. The size of the engine dictated the change to a 320 rack. Further complicating matters was my choice to run the electronic power steering column. This arrangement required 3 U-joints! After getting everything installed with a bearing on the long shaft it seems to work well. I have however, discovered that the power assist is not needed. This means I may got to a manual column or shift the steering attachment points to tighten the turning radius. I fear as is it will be larger than a suburban. Finally, I built up a bracket to support my hand me down electric fan from my new radiator. The whole assembly is removed as one. It should help with serviceability down the road. The goal is to be road worthy this August. I am hoping to drive the 5 miles each way to make a portion of the Woodward Dream Cruise this year. I haven't made as much progress as I would have liked, but some of the bigger questions are starting to get answered. 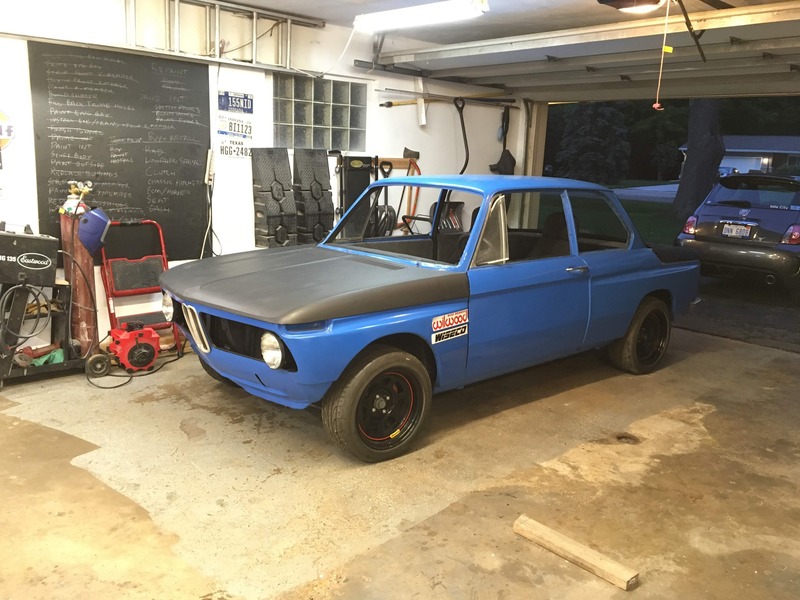 When I first started the swap I knew there would be a few big hurdles, Rust, fitting the engine and trans, connecting the steering, and completing the driveline. I will this next weekend cut out and replace the last rust in the door. As usual for this car about 1/4" of bondo had to be removed. Thankfully after that was removed not a ton of rust was found. I will just replace the area around the corners to make the patches smaller. Now on to steering....There are two sets of OEM hardware that I have worried about connecting to. First is the Steering rack from a BMW 320i (1980). I finally found a 17mm-51 spine u-joint that fits Perfectly! As you can see I will have to add a kink in the joint to clear the starter. it does clear so that's a win. Next week the rest of my steering components will come in. I hope to get that as well as the passenger side tunnel complete over my Christmas holiday. The misses is already informed that my 2018 new years resolution is to drive this car. It might have no glass or weatherstripping but I will drive it next year. 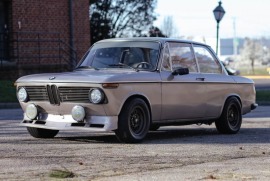 It’s been quite a while since I last really dug into the BMW 2402tii. My wife ended up going back to school so most of my dreams of getting the car road worthy this year are out the window. I most likely will not be able to afford the big pieces for quite some time. That was a bit like knocking the wind out of my sails. I have decided to plug on anyway. I will try to get a solid foundation. I should still be able to get the steering and plumbing worked out. As well as clean, sort, and seal the underside of the car. I might even go back and redo some of my previous work. With a project like this one as my first I know that my skill has improved, from non-existent to not too terrible. Enough babbling, on to the updates! 1. I found a steering column! I found a link through a mustang forum that a GM electric power steering column could be retro fit. The assist is built into the column so it can be turned up, down, or off. It is controlled by a potentiometer kit that you can get from Ebay for ~$50. http://forums.vintage-mustang.com/mod-custom-forum/670865-anyone-want-100-electric-power-steering-here-you-go.html 2. I have shifted the driving position rearward to help with leg room and weight bias. I never had an intention to put the back seat back in 3. I have built mounts to use NA Miata seats. The current ones I have are from pull-apart and being that this is Michigan, they are extremely rusty. Still for $23 they are good enough for mock up. 4. The AR5 transmission that matches my Ecotec is HUGE. I’ve had to considerably enlarge the tunnel. I’ve been putting off this sheet metal job for the better part of a year. I finally tackled the driver side and closed it all in. 5. I primed and seam sealed the whole side. This is most likely the floor section I would be most likely to redo. 6. Finally I covered it all with bed liner and threw everything back together. Of course the next thing I did was sit in the car make engine noises and pretend to shift. I do need to get the car on the ground and see just how bad ingress/egress is. header, civic radiator, and more! I picked up a radiator for a 1994 Honda civic 1.6l (auto with air conditioning) for <$35 shipped on Rockauto. It filled the stock radiator opening almost completely. We will have to wait and see if this radiator is large enough to cool the 2.4l that is now in the car. I am hopeful the auto and ac options added to the cooling capacity. The description of this one did also say that it was a few mm thicker to offer additional cooling. I will also add the Civic electric fan as well. The reason I chose this route is purely cost based. This will let me get up and running sooner because it costs less. More than likely I will have to upgrade in the future. the radiator is mounted to the car using the boxed section behind the air dam. I will add a pair of grommets to act as isolators between the chassis and radiator. The top is held in place with a simple bracket tying the radiator to the core support. The next project of the weekend was building an exhaust manifold. I did not want to use the stock one, purely from an ascetic point of view. I have also always wanted to give header fab a try. surprisingly it wasn't too bad. The most difficult part was getting enough heat into the flange without burning through the tube. Cutting and welding the tube sections together was not bad at all. Having a good saw to make straight cuts was crucial. I started with a generic collector that had the four primaries and a 45 degree bend. I then picked up a 3/8" flange and a pile of 1-5/8" u-bends. The all in for this header was around $175. Not bad, but it will end up wall art when I add a turbo down the road. Had to throw in a few beauty shots now that the car is starting to get more together. The 1600-2 is a 69 built in 68. The 68 Texas plate I had lying around looked much more classic than the 69 (just looks like a worn out plate). Like most of my car, the rust I saw was just the tip of the Iceberg. It took another near full day to strip off the past two paint jobs and rust. After getting down to bare metal the bottom three inches were pretty much gone. After getting to that point I hit the whole thing in a light coat of self etching primer. Then it was on to using the lower door skin from Wallothnech. First of all they do fit pretty well. Removing the old one was as simple as marking the outline of the new panel, cutting with the cut off wheel. Then around the edges with a flap wheel and the skin peels right off. The tabs on the back do have a few spot welds. Then I cleaned up the panels and hit the whole inner structure with rust reformer. The new panel is straight, doesn't really have the slight curve. After a little finesse with the hammer and dolly and liberal use of clamps it was in place. Then about a million tack welds later it was in. The last part was folding over the tabs. I don't know if this is truly the correct method, but it made sense to me. Lessons for anyone wanting to do the same.... 1. the panel as is places the seam within 1/2" of the lower character line. If you have good enough metal I would cut the new panel down to stay a little further from that joint. 2. Really take your time welding. I jumped all over the panel, but still managed to get a warp in there. 3. folding the tab on the back is a bit tiring. 4. Be careful folding the tab over. I was a little sloppy with the dolly and it really complicated matters. Finally getting the blue paint on resulted in a better outcome that the rest of the car. A smaller panel and better dust control resulted in a better job. Not a ton of heavy progress, but the car is back on it's own wheels with new bushings, freshly painted sub-frames. I've also reworked the hood and trunk in flat black. They are both super rusty and rough. They will be replaced with fiberglass in the near future. After quite a bit of trial and error, I think the procedure for engine install has been perfected. I still have one more round of tear down and reassembly to go. The engine looks right at home in it's Massey grey engine bay. I think the wrinkle black valve cover turned out well. The original grills were not really salvageable. So I have tried making the later plastic grills work. For a track rat it should work... The other area of progress has been stripping the rear sub-frame. The grease was I kid you not 3/8-1/2" thick. Right now the hub castle nut is winning. Time to get a bigger wrench. The other area I am still trying to determine my path forward is the roll cage. I would like something to mount harnesses to, and to keep my head from going in the ground should things go terribly wrong. I am between an autopower cage, or spending a boat load to have a custom one made. I can weld, but this is not something I would really trust myself to do. The other catch is a full on pro built custom cage would cost roughly 1/5-1/3 what the total project will. I didn't get as much time over the holiday to work on the BMW as I had hoped. I was still able to finish up the shifter and mount for the transmission. I got them painted up and installed the steering rack on the subframe. I had to change out the oil pan on my donor engine. In the process I found out the engine must have been well cared for. It was super clean inside. Then came the fun. First i tried to drop the engine from the top. Then I attached the subframe. Then the pain started. Trying to wrestle that transmission onto the engine proved near impossible solo, so I took it all back out. Then, I installed the engine to the subframe, put that on a dolly. Then installed the transmission. Then I wheeled it over to the car and found the scope of the mountain to be climbed. The car needed to go up 10"+ in the front to clear. I tried lifting and that worked out, but the rear jack stands made me nervous. So I moved then further back to the diff mount. Then using a spreader I was able to jack up the front of the car and slide it in. It's not all the way in yet, but the garage is the least clutter with parts it's been in a year, so that's a win. The front cross member finally got cleaned up. Finally got around to boxing in the relief for the Ecotec's oil pan. I still need to clean up the 320I steering rack bracket, and the other new ball joint to come in. the weather also cooperated with warm enough temperatures for the paint to dry. I replaced all the bushings with new one from Prothane. I also added a brace to the from of the cross member. The hardware was all new from wallothnesch, as usual surprised how reasonable their prices can be. After all the cross member work i started on the shifter for the Asin AR5 transmission from a Saturn Sky. The shifter bracket it should have come with is apparently unobtainable. Beyond that the shifter for that mount is pricey. After some investigation i was able piece together a bushing from a 2000 ish mustang V6 manual with an ebay shifter for a Fox body GT (T5). Long story short it's cheap and there are other options for upgrade. The ebay shifter is short. However it's very vague. Front to back is totally ok. left to right is very very close. I might end up looking for a non-short shift t5 to see if that helps. Finally the car looks better than when i dragged it home 18 months ago. Every surface of this car was covered in 3 paint colors, and up to 3/8" of bondo. It took 6 hours with a wire wheel just to clean the roof. Things I learned about this car: This "2002" is actually a 1600-2 It was originally off white, then orange, then metallic green It must have been rear ended at some point - The quarter panels at the front of the trunk was a train wreck - The roof had some ripples and signs of being pulled, 4 screw holes (filled with bondo of course) - The weather stripping was NEVER removed since 1969 - There was WAY more rust hiding than I even thought -3 of the springs were lowering springs, 1 wasn't Back to the progress: -Body was reasonably worked. It's a track car, not a show car. There are some waves in the rear quarters on the box flares. I must not have installed them correctly. - The roof still has waves. The sheetmetal was way out. I tried to keep filler to a minimum to prevent cracks from forming. - The car was primed a few months back before I moved. I ended up sanding most of that away and priming and sanding again a few times. -I painted the car with spray cans, I can hear the laughter now. This was a cheap paint job to get the project down the road. After i work some bugs out in the future it might get a real paint job, or the savings applied to more track days. - Total including supplies ~$250 for the paint job. - 1 light coat and 2 heavy coats were put down. - 320i calipers were painted red to add a little bling. Next Phase - Rubberized rust encapsulate the underside - Box in and paint the front cross member - Paint the suspension parts - MAKE IT A ROLLER AGAIN!!!! If you can't tell I'm pretty excited to have the car looking ok and starting to look more and more like a real car. I've finally started making some progress. I've managed to rebuild the front struts with new tubes. The ones that came with the car were mangled. As in one strut insert crammed into an older one. Any way, new bearings 320i vented rotors and 320i calipers. I also threw a fresh lick of paint on everything. A fun discovery, one strut doesn't match the others. Other fun discovery the car had 3 lowering springs and one normal. I was under the assumption it was the mangled strut sticking that was causing the wonky ride height. I have added a little bit of plate to the front frame rail to match the overall thickness of the 2x4 sub-frame connectors. I also added in to 1.50" tubes to tie the front sub-frame mounts to the firewall. Finally after much scrubbing the engine bay was cleaned primed and painted. The goal as of now is to get on the road. A true nice paint job will happen in a few years after I've actually driven and sorted the car. As of now the engine bay is getting Massey Ferguson implement paint and the rest of the car will be getting matte black implement paint. I painted one of the quarters as a test. I think it turned out pretty good for a quick and dirty get me driving paint job. I've recently accepted a new job all the way up in Michigan. That means it's time to get the car kind of back together so I can move and continue the build. The goal has been to finish up some bracing and get the whole car in primer. Most of it will have to come off in the process of blocking the car, but at least it's one color. Don't want to scare off the neighbors too quick. There she sits on the brand new Basset racing wheels with the 205/50R15 tires. The wheels are good quality, cheap and in my opinion look awesome. The downside and it's a big one, they weight a ton. Seriously they are 20# a piece. At $50 a wheel they will serve well for mock up and getting me on the road. There is the bracing that was added. I realize it won't add the most in stiffness but it makes jacking the car up so much easier. The transmission tunnel had to pretty much come out to clear the Asin AR5 trans that mates up to the LE5 2.4L. The shifter looks to be a bit rearward, but I was planning to more the driving position rearward as well. The tubes for the bracing go through the floor pan and are then sandwiched inside the existing frame rails. I will eventually add some extra plating to beef up the frame rails extending to the front subframe. I have started putting some of the trim back on. My thought is, should be less likely to be damaged if it's on the car. The fenders and the wheels seem to fit like I had imagined them when to project started. There will be a ton of body work to go. The deck lid has become my paint test area. It is so rusty and full of bondo I have deemed it a lost cause. It will be replaced with a fiberglass skin at some point in the future. Those are spare Alpina flares. They need a good home, anyone in the DFW area PM me and come and get them. Finally got the subframe clearnaced to allowe the engine to move back 2". I was also able to drop the back end a little bit. For engine mount isolators, I'm using 1991 BMW 318i hydraulic mounts. Above is a picture showing were they mounts are on the subframe and where the oil pan is in realation. The passenger side engine mount I made out of 0.100" 4130 steel. It's not pretty but it's not bad for my first iteration. The driverside was made using 1.50" X 0.120" roll cage tube. I tried to make it a bit smaller to allow more room for the dipstick, steering and master cylinder. Final result, engine is in, supported on it's own mounts. I look to have enough room to use an off the shelf budget 3 pass radiator with fan and shroud, from eastwood. The next big mission will be getting the transmission in. That will take a substatial amount of clearancing to make it fit. Once the big pieces are in place I will probably try to get the rest of the steering assembly mocked in before cleaning up mounts and adding more bracing. I've spent the better part of a year just dealing with rust on this car. So far the following have been repaired - floor pans, all four quadrants - rockers, both - lower quarters, both - front cowl area, pretty much the wiper spindles were all that was salvagable - under the back windows -still to do the doors Then I got a bit side tracked and wanted to make it pretty so, I put on some box flares. I also managed to track down a rack and pinion out of a 320I. It was a manual rack. The thinking was to clear up some space in the engine compartment. Although it seems I could have probably made the stock steering box clear. That bring me up to today. Finally tracked down the drivetrain pieces that I have been looking for. The transmission is out of a Saturn Sky Redline. It should be good for up to 300 ft-lb, more than I'll make. I picked it up for $450 with hydraulic throw out bearing. The engine is from a 2009 Pontiac G6. It's a variable valve timed, all aluminum DOHC 4 cylinder. In stock form it puts out ~170 hp and 165 ft-lb. In this installation the exhaust and intake should free up a few ponies. The engine is used quite a bit by sand rail guys. They can be tuned to 200+ NA and up to 300hp with a turbo. The bigger pluses for this application, weight and price. According to all sources its no heavier than the M10 that came out, so handling shouldn't be spoiled. Price is hard to beat at $475 for the complete engine with all electronics and harnesses. Before anyone gets too angry. I started with a 1.6l, the amount of money needed to get to 170hp would have been way more and it would not have had electronic fuel injection.